SK-II has always been a leader in innovative skincare technology. The brand's revolutionary new eye care device, the Magnetic Wand, is no exception. The Magnetic Wand is the first of its kind in the world: it is the first device to apply cutting-edge tri-magnetic technology to skincare, and the first to utilize diamagnetic repulsion power for skin. The Magnetic Wand was specially developed to be used in tandem with SK-II's STEMPOWER Eye Cream. 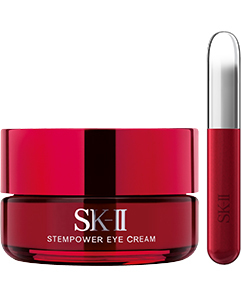 In order to enhance the efficacy of the eye cream, SK-II developed a special bi-polar magnetic microarray that specifically matches the molecular properties of Niacinamide, the key ingredient in Stempower Eye Cream. This key ingredient is repelled by the magnets of the Magnetic Wand, thereby being pushed into the targeted layers of the skin. When the SK-II Magnetic Wand is moved over the face, it induces a micro-electromagnetic field that further enhances the absorption of ingredients into the skin. When researching the Magnetic Wand, SK-II tested several different micro-array types and patterns to find the most effective one. In tape strip studies, the lower layers of the stratum corneum in the skin contained three times more Niacinamide when applied using the chosen micro-array within the Magnetic Wand as compared to when the product was applied using only the fingers. Thus, using the Magnetic Wand with Stempower Eye Cream is more effective than applying the product using your finger, with the skin absorbing three times more of the key ingredient. Together, this potent combination of skincare science and magnetic technology can visibly reduce the fine lines around the eye after just 10 days of usage.